Anti-DogmatikSS - Rompan filas, 10,17 fr. 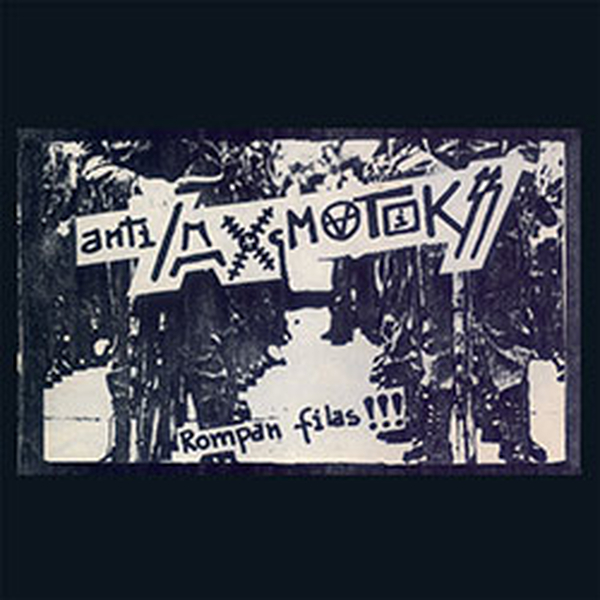 Before going on their Spanish mini-tour with the Dutch hard-core band BGK in November 1984, Anti/Dogmatikss made a first stop at the Marathon Studios in Barcelona, recording 11 songs that would turn into their first self-published cassette to be sold on that same tour. The demo was titled ?Rompan filas!!!? (Break Ranks!!!). Musically, the recording shows the evolution of the band towards a more hard-core sound, accelerated and furious, closer to the style of the Italians Wretched. It included tracks like the now classic (Fire at the Moncloa), Piérdete! (Get Lost), Anti-U.S.A (a song by the band Epidemia with a guest chorus by Quoque from Kangrena), Hacienda, Was a boy? (Who?)>>. The tape came with an insert (a folded paper) with collages, song lyrics (some written by Joni D. and Cristian Dios from the band Dios), photos of the band and a manifesto (that we will include in this re-issue). As an extra we?ve included 13 songs on the B side of the vinyl, recorded at Kangrenas? practice place and at their practice place at Les Mosques St., most of them unedited recordings with different line ups. Extortion - Loose screws - 10"
Extortion - Control - 7"